Meet the mysterious druids and find hidden treasures amongst ancient statues in this Celtic inspired video slot. One that shows you carved runes and letters to keep you going. This video slot features 5-reels and 25-pay lines, Scatter Symbols, Expanding Wild Symbols, and a splendid Free Spin Feature - so, get ready to meet the ancient druids and get ready to pick your stones in this mystical Secret Of The Stone video slot that can win you up to 350,000 coins! 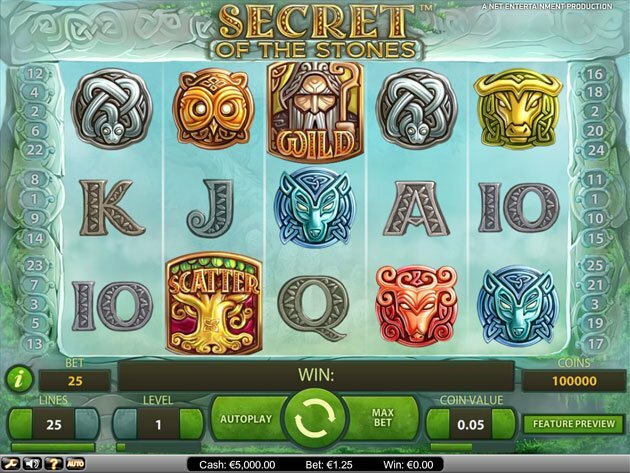 The Celtic inspired video slot offers a mysterious and eager feeling of what might come. With a design and graphics that reminds of the one in Gonzo´s Quest – it certainly creates the same fulfilling vibes. The game is stunning and the details in it are incredibly well-made. This, together with the rewards offered, all makes up for a great and entertaining gameplay. The symbols of the game are all customized and made optimal to the theme of the game. The lower valued symbols are represented by the standard card deck symbols, designed in carved stones. These range from 10 to Ace and are all worth between 50 and 150 coins for a symbol combination of 5x. The higher valued symbols are then represented by the red deer, the brown owl, the green bull, the blur wolf, and the silver snake. All are in carved stone as well – in great details. The red deer is the top player of the game with a thrilling worth of 1250 coins for a symbol combination of 5x. Apart from this, there are also a few extra special symbols – granting you high wins and great features. The Scatter Symbol is the Mysterious Tree and there are a total of four various Wild symbols! We will get more into these shortly! Secret of the Stones takes players back in time – all the way to the oh so fascinating age of the Stonehenge. These infamous monuments were built in several stages, which began around 5000 years ago. It is a monument built (unknown how) solely of megalith stones, standing in a patterned circled in the middle of a meadow. It is still to this day a mystery how they could build this, transport the stones, lift them, etc. with no machines. It is also unknown what the reason for building this was – it is, however, said that they used to use the Stonehenge to tell the time. it is a brilliant mystery – but we will let that rest for a while. It is time to figure out the mystery among these stones, let us find the hidden secrets! The Secret of The Stone video slot offers mystical action while you can relax from the gothic tones in the background. The design and graphics of Secret of the Stones are simply amazing – the carved stones are made in absolute perfection with its small and well-executed details. It is a sheer pleasure on the eyes and it is hard not to enjoy the game and all it offers. The Secret of the Stones is played with 5 reels on 3 rows and an additional 25 paylines. Players can choose how many to keep active during the game – but the more the better. This with a betting opportunity of 0.01 and 0.50, with levels of between 1 and 10. The features are based on a great free spins feature – and that feature starts with a bonus game. When this starts, players are transferred to the secret garden of stones and the Druid will offer you 3, 4 or 5 lucky picks and choose from 20 stones. This to increase the chances of wins in the Free Spin Feature. This is how you spin your way to the Free Spin Feature. Once you hit 3, 4 or 5 Scatter Symbols, the feature will automatically start and you have been awarded 10 free spins. But first, you will be transferred to the above mentioned secret garden of stones. In this mini-game, you can be awarded 2, 3, 4, 5, and even 10 extra free spins if you pick the right stones. You can also find extra multipliers of x1 and x2 that will add to your free spin multiplier once you have completed all your picks. If you pick the right stones, you can also be awarded Extra Wild symbols. Reel 2 and/or 4 will transform into 1 or 2 completely wild reels in addition to that you can also get some Extra Wild Symbols where the Deer and/or the Owl Symbol acts as wild throughout your Free spin Feature. Once you are done clicking stones, simply click on Continue to get to Free Spins and click on Start Free Spins when the new screen appears. There are as mentioned a total of four Wild symbols in the game, and these are the mysterious man, the owl, the golden deer, and the expanded Wild (also the mystery man). These can all jump in, in both base games and features, to substitute for all symbols apart from the Scatter symbol. You can try this amazing video slot from no other than NetEnt, for free or play for real money at VideoSlots.com. 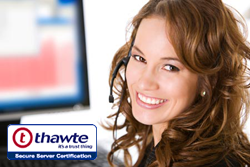 NetEnt is a premium supplier of online casino games used by many of the world’s most successful online casino operators. The NetEnt CasinoModule™ is a leading- edge gaming system which includes high-quality online casino games, powerful bonus programs, and a sophisticated Back Office. Founded in 1996 by one of Scandinavia’s leading off-line casino operators, NetEnt was one of the pioneers in online gambling. The heritage in real life casino operations is one of the reasons behind the success of the company. NetEnt is unique in the market, not only in its focus strategy on casino games, but also because the company does not have any casino operation of its own, nor any interests in such operations. This means that there are no conflicts of interest between NetEnt and its customers. Thanks to a combination of our heritage and focus strategy, the NetEnt casino stands in a class by itself. Another contributing factor to the success of the NetEnt games is the high entertainment value delivered through rich graphics, intriguing bonus games, fun animations and innovative features and functions. Some of these thrilling games are Starburst, Creature from the Black Lagoon, Piggy Riches, and Thunderfist.